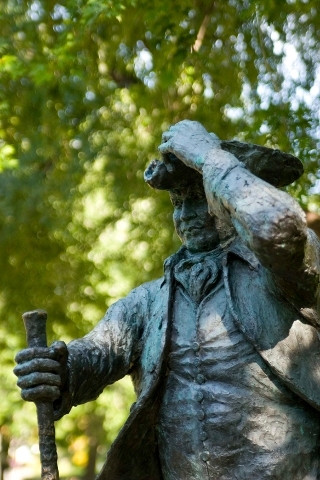 James McGill, the man whose vision would lead to the creation of the University that bears his name, was born in Glasgow, Scotland on October 6, 1744, the eldest son of an ironsmith. During his studies at Glasgow University, McGill was shaped by the values of the Scottish Enlightenment. Although he left university without completing a degree—a fact likely due to his family’s poor fortunes—his education instilled in him a lifelong love of new ideas, and a commitment to give serious thought to the beliefs and opinions of others, no matter how at odds they were with his own worldview. Sometime before 1766, McGill immigrated to North America and entered the rough-and-tumble world of the fur trade. His hard work and French fluency served him well as he spent much of the following nine years in almost constant danger, navigating the rivers and lakes of the Great Lakes frontier, wintering in unmapped wilderness and living off the land. By 1775, McGill had established himself as a successful merchant, trading in furs, ammunition and general goods. He said goodbye to bush life and used his fortune to settle in Montreal. There he married an industrious francophone widow, Charlotte, and became stepfather to her young sons. McGill's dedication to public service distinguished him from many of his fur-trading contemporaries. A volunteer Colonel with the Montreal militia, he led the defence of Montreal during the War of 1812. He served as a city magistrate for many years, making him part of a council that was the de facto government of Montreal at the time. He was also a member of a committee that reported on the need for a Legislative Assembly for the colony of Lower Canada, to which he would be elected three times. Always a visionary, McGill was determined to create a rigorous system of education for Lower Canada. During his time as a legislator, he participated in the debates that would lead to the establishment of the Royal Institute for the Advancement of Learning (RIAL), a body designed to establish a formal educational system in the colony. McGill took great care of the welfare of others, including his step-children and the orphan daughter of a friend. This ecumenical and generous spirit manifested itself in his final will, which, after his death in 1813, revealed a bequest to the RIAL for the founding of a college. Spurred on by the gift, the RIAL became the governing body for McGill College, which was officially established in 1821.